The legend returns! Experience one of SNK's most beloved classics, appearing on PS4 and PS Vita in its original form. We’re finally worthy. 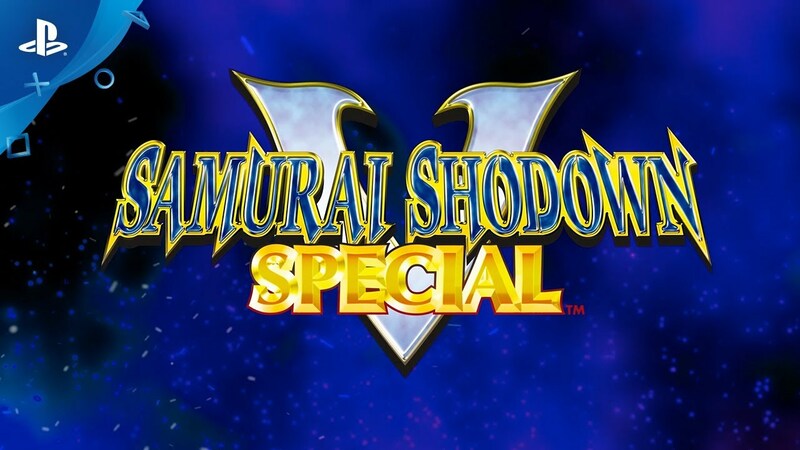 Heralded as the magnum opus of the fan favorite Samurai Shodown series, the home version (AES) of Samurai Shodown V Special was a victim of circumstance and experienced a rocky original launch. The arcade version of the game was a clear evolution of the series, building upon what was already one of the most violent fighting game series in the industry. The most notable addition was the inclusion of brutal Overkill moves which gave players the ability to end a match with a visceral fatal strike unique to each character. Samurai Shodown IV had already featured generic fatality-like moves, and Samurai Shodown V Special was meant to take that even further with character specific moves. That arcade version of the game was already controversial for its level of violence and gore, but after a violent incident in Japan the fate of the game’s home version was in question. The game was mysteriously delayed right at the last minute, and the community was shocked to find out upon release that the home version of the game had been heavily censored. The last-minute censoring also resulted in critical bugs popping up in the game and SNK quickly issued a recall in response to fan outcry. That recall issued bug fixes but only partially restored the censored parts of the game. Today, we are happy to announce that we have heard our fan’s requests to bring this game back in its original form, and have been working with our partners at Code Mystics to deliver the game to PS4 and Vita. The goal from the start has been to give the game a proper release that will not be marred by the circumstances that hobbled the original AES launch. Our team believes that it is important to see the game delivered to fans as the original creators intended. 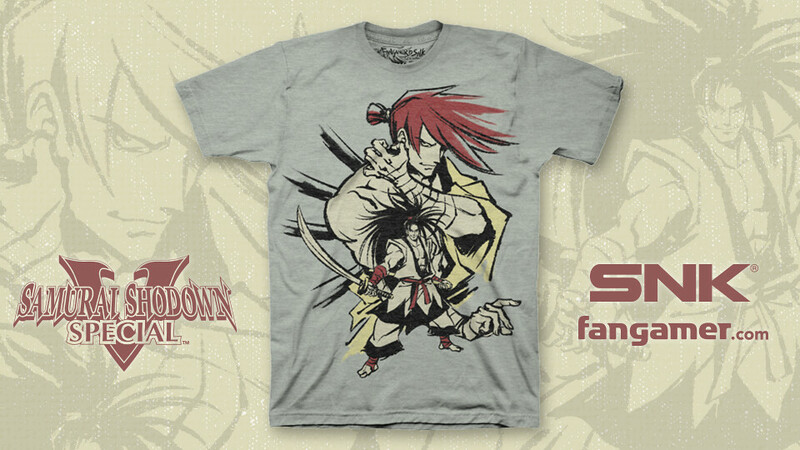 Samurai Shodown V Special is one of the most well-regarded SNK fighting games among the fighting game community. It is easily one of the most balanced games in the series and features both brand-new systems and an extra layer of polish on already existing mechanics. 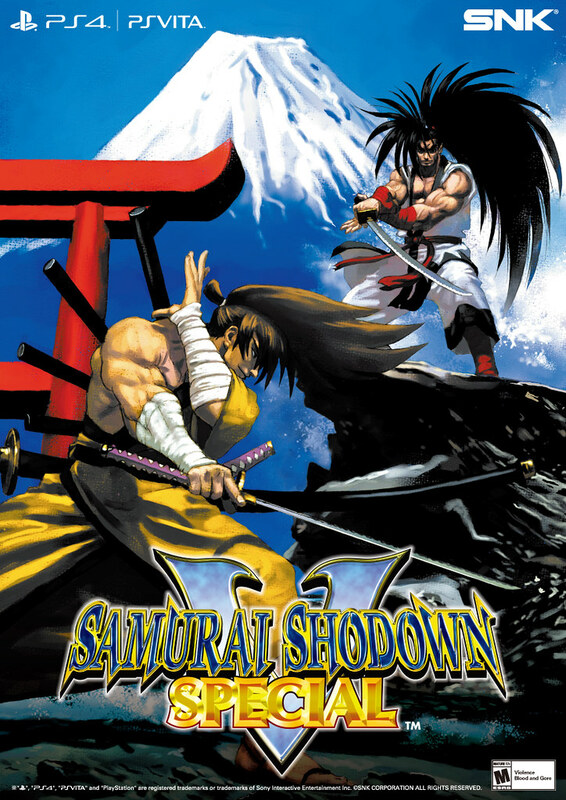 The game is designed to place emphasis on the qualities that are unique to the Samurai Shodown series. With much less of a focus on combos and supers, victory in Samurai Shodown V Special at high level play will usually come down to using range and spacing to your advantage. Sword Gauge: A meter that directly affects how much damage you do. Any attack—even whiffs or blocked attacks—reduces the meter and the amount of damage you can do. It slowly regenerates to maximum when you are not attacking. Rage Gauge: A staple in the Samurai Shodown series. Taking damage fills this meter and once at max it results in increased attack power along with other bonuses. A Rage Explosion command can also be used which can be used to push back your opponent and open up other possibilities. Weapon Flipping Attack: The super special move of Samurai Shodown V Special. It can be used while the Rage Gauge is at max or during a Rage Explosion. The move will both deal significant damage to the opponent and disarm them. Concentration One: Only usable under certain conditions, this move will result in your opponent going into slow motion while you move at normal speed. Combined with the damaging Fatal Flash command that can only be used in this state, this command is perfect for staging last minute come-backs. Overkill Moves: These are ultimate moves that can only be used once during a match against an opponent who is already on the ropes. Landing this move will result in your character executing the opponent with a brutal, visceral secret technique. As with all of our collaborations with Code Mystics, this release will feature new content such as online multiplayer, a Gallery mode with unlockable art, and trophy support. This will be the first time the game has been available in its original form on a modern console. And we are happy to announce that we will be showing a playable beta of the game at our booth during EVO 2017! We hope all of our fans attending the event stop by to try out the game and give us their feedback! A true samurai fights with dignity and honor. But that doesn’t mean you have to. Whoa, WITH blood! I actually have an AES cart with the blood included before the game was modified to remove it. Awesome news! When is the release date and is it cross buy? The other SNK games that were ported to PS4 & Vita by Code Mystics (Metal Slug 3, Last Blade 2, and Garou: Mark of the Wolves) were all cross-buy, so the outlook is good for this one to be cross-buy as well. Yup, the game will be Cross Buy and Cross Play just like our previous titles. Stay tuned for more news on the release date! You had me at the confirmation of it being uncensored. Also I hope that you guys took in some feedback from MoTW’s and LB2’S releases regarding the netcode though. Great news. I own the original unfixed release of this game on NeoGeo AES. Please give Samurai Shodown 2 the same Code Mystics treatment. I don’t know how you bastards managed to pull it off TWICE but I can know I can cut up the annoying -Ruru sisters again. This actually gives me hope for Sword of Destiny and SS64. P.S. While you’re at it, how’s about giving us KoF XI, NGBC and SVC Chaos? Yes please, but proper ports with online. NOT the PS2 releases. Real Bout 2 also deserves a proper port, as mentioned by rafael. And i was about to reinstall Samurai Shodown 6. Not anymore! i want this now. Say what you will about BC, but this is my kind of game preservation: Bringing back the original game in its true form, before the compromises that were made to bring it to console the first time. Excellent work. a remaster of samurai shodown 2 is what most samurai shodown fans want! Just release a current generation SS game for crying out loud, fk these old cr_p. Can’t wait to play this on my Vita and PS4. Mostly my PS Vita though. Is there going to be a physical copy released? This sounds like an optimal chance for a ridiculous collector’s edition. PLUS, it looks like an opportunity to finally translate and release Samurai Spirits RPG to America as well!!! What pre order bonuses will be offered??? THERE IS NOT ENOUGH INFORMATION TO SATE MY EXCITEMENT!!!!! !